According to a new market report published by Transparency Market Research “Interventional Cardiology Devices Market - Global Industry Analysis, Size, Share, Growth, Trends and Forecast 2014 - 2022,” the global interventional cardiology devices market was valued at USD 8.7 billion in 2013 and is expected to grow at a CAGR of 2.9 % from 2014 to 2022, to reach an estimated value of USD 11.2 billion in 2022. Coronary artery disease (CAD) is one of the most common causes of death globally. It is a progressive condition that leads to obstruction of blood vessels in the artery providing blood to the heart muscles. Increasing incidence of cardiac artery disease is one of the prime factor driving the growth of the market globally. According to the World Health Organization (WHO), CADs account for 64% of all the cardiovascular deaths and is a major cause of loss of quality of life among men and women. Likewise, according to the Centers for Disease Control and Prevention (CDC), coronary heart diseases accounts for 370,000 deaths in the U.S. each year, and around 1 individual in 13 suffers from coronary artery disease. Coronary artery disease is also considered as the most common cause of premature deaths (aged <65 years) and accounts for 401,000 deaths in Europe each year. Hence, rising prevalence of coronary artery disease would increase the demand for percutaneous interventions, which in turn would propel the growth of interventional cardiology devices market. Furthermore, various advantages of percutaneous interventions over coronary artery bypass grafting, have been primary factors responsible for increased demand and are expected to drive market growth during the forecast period. These advantages include reduced hospital stay, quick recovery and reduced cost. Depending on the type surgery devices, interventional coronary artery surgeries mainly utilize catheters, stents, PTCA balloons, PTCA guidewires, imaging systems and others. Of these, stents accounted for over 59% share of the market in 2013 and would continue to lead the market in future in terms of revenue. Stents market is further subdivided into bare metal stents, drug eluting stents and bio absorbable stents. Presently, drug eluting stents are considered gold standard treatment for opening the blocked artery and thus majority of the stents revenue is generated by drug eluting stents (DES). However, delayed healing and risk of thrombosis (blood clotting) associated with DES which may lead to death and restenosis have led to introduction of bioabsorbable vascular scaffolds (BVS). Thus, gradual shift of surgeons from DES to BVS, is expected to decline the market share of DES by over 23% by the end of forecast period, which will be captured by BVS market to grow at a CAGR of 25.7% from 2014-2022. 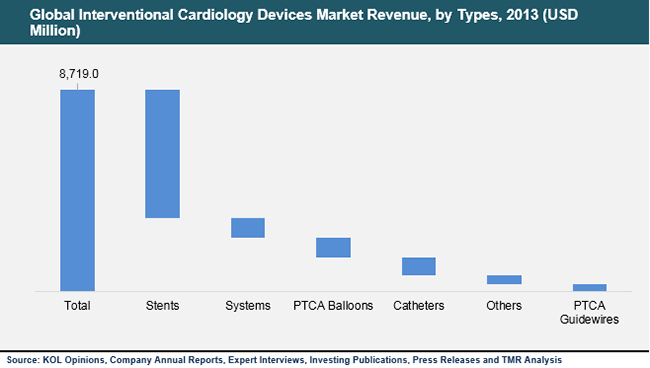 Boston Scientific, Abbott Laboratories, and Medtronic plc are the key players that collectively accounted for over 60% share of the interventional cardiology devices market in 2013. St. Jude Medical, Terumo Medical, Volcano Corporation, and Reva Medical, Atrium Medical, AngioScore, Johnson and Johnson (Cordis subsidiary), Elixir Medical, and MicroPort Scientific Corporation are other prominent players in the market.